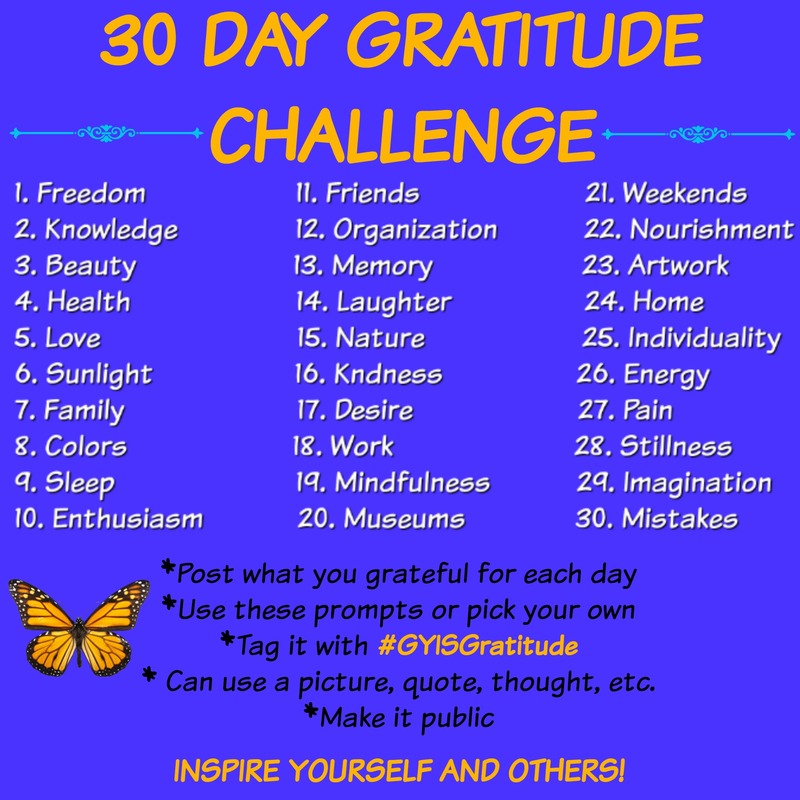 We are trying something new this year - a Gratitude Challenge. November is a time we look back and ahead and give thanks for all we have, so I thought it would be the perfect time to implement this challenge. Who knows, by the end of this you may be inspired to keep it up year round. Whether things are good or bad, focusing on what you're thankful for makes them even better, and I'll hope you'll join me in the Gratitude Challenge and share some of that gratitude goodness in your life to inspire others. • “Challenge” is just a word. It’s not so much a “challenge but rather a way to inspire you share something (a photo, illustration, quote, etc.) every day post something, someone, someplace, etc. that you are grateful for. I have included some prompts/ideas to get you going, but this is your challenge so get creative, make up your own prompts, etc. And don’t feel pressured to attain perfection, either. Thankfulness is what it’s all about; no need to be a professional photographer or artist! • Join in at any time. The point of the Challenge is to focus on staying thankful for thirty days. You can start the challenge on November 1 and do it for the whole month, or you can start the challenge any day that works for you and follow along at your own pace. And although we have called it a 30 Day Challenge – it doesn’t mean that you have to stop there. Keep it going for as long as you like! • Use the hashtag #GYISGratitude. Sharing your pics, quotes, thoughts, etc. on your Facebook page (must be public) and tag them with #GYISGratitude. Making it public is the only way we can see them, others can see them and you’ll be able to see all of the other cool things that other people are sharing. You must do this to be consider for the prize pool. Yes, we will be giving away prizes to 2 lucky participants! • Save or print out a reminder. Keep up with the suggested prompts by downloading the challenge, print it out and post wherever you'd find a reminder helpful (save it to your phone, perhaps! ), so you can stay on top of the prompts. Of course, you don't have to do them all in a row, but there is something special about spending 30 days focusing on what you're thankful for. OR make your own list ahead of time, so you can stay on track and not miss a day. See below to click and print. Promote self-care and self-awareness and to be more present in our everyday life’s. Yes we are going to award a prize to lucky participants. See below for the rules. Click "Download Now" below for the PDF version. Click "Download Now" below for the JPEG version. Now that you've got the prompts, you're ready to begin the challenge -- and enter the giveaway! Two winners will be chosen on Friday, Dec 7th and we will post the winners on the VIP page. See below for entry rules and details. •Tag your photo, quote, thought, etc. with #GYISGratitude on your Facebook page. Must be public for us to be able to see it.. I can’t wait to see what everyone is grateful for and gather some inspiration from all of you! Don’t want to participate, not problem, but you might want to check out the hashtag #GYISGratitude and gather some inspiration from the others! The audience selector pull down menu lets you choose a specific audience when posting. Your options may include: Friends, Specific Friends, Only Me, and Public. Choose the Public setting and make your post. That's all there is to it! Our Group Personal Training program is specifically designed for people who want to workout with a passionate and fun group of like-minded people who have a desire to be, do and become more. We specialize in putting ALL fitness levels in a positive group environment that creates motivation, inspiration, inspiration and accountability. 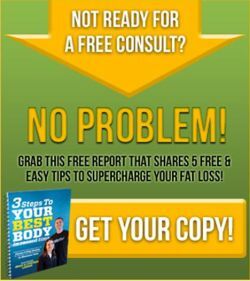 If you have read this far then it's clear that you are truly serious about making a positive change in your life and you want more then ever to a sculpt, slim and fit body that will give you the CONFIDENCE you deserve. Most people want it, but few will actually do anything about it so let me take a minute to acknowledge YOU for taking this first step. I want to be very clear - this may be an important consideration for you - our program is NOT for people who want to "get their butts kicked" or walk out of a workout feeling like they've been hit by a bus. They are not for anyone who wants to be in a competition each and every workout session. Our workouts are scientifically designed to deliver body-transformation results AND make you feel & move better than ever before. Form and function are two very important factors in our training program. Don't worrying, though, as we will educate you on how to do both. ​I also want to share that Get You In Shape is a small, family-owned business that puts a real emphasis on relationships. We consider our Clients a part of our Get You In Shape Family, and they share the same view. We’re NOT like a big-box facility or a national franchise that basically rents you equipment and may offer some personal training services for a few hours a week. 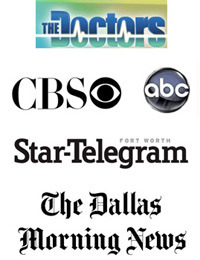 Our clients’ success goes beyond the programs and services we offer. The relationships we create and our clients’ strong desire to do business with US is how we can truly make a difference in their lives. But don't take my word for it, check out our 500 plus YouTube Success Stories on our playlist ​on the top browser. These are REAL PEOPLE with REAL Success Stories!